If any genuine ladies and knights still survive somewhere in the world, they should definitely be found in Richmond. 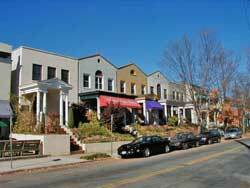 Its flavor1 of a big modern city still mingles2 with the remnants3 of the aristocratic past. 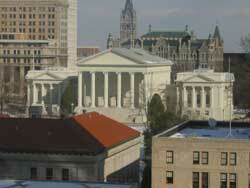 There is something ineffable4 in the way Richmond people talk and conduct themselves. Their manners are truly refined, without being exaggerated or unnatural. It is not the usual American courtesy5, which serves as a source for thousands of jokes on both sides of the Atlantic Ocean, it is something inherited from the glorious past. Now this tempestuous6 past, along with slavery7 and cotton plantations, is gone with the wind, but the finesse8 remains. Very rarely will a commoner9 name Richmond among the cities or towns he knows in America, still it was two centuries ago the very town which could possibly change not only the history of the United States, but (as grandly as it might sound) the history of the world. Now there is no more pretence, but only a quiet and measured life flowing majestically10 on the borders of the River James, with everything so typical and mystically attracting about the real American life: its spirituality11. Richmond, as well as many other towns, knew its rise and power, but it also knew its brilliant and sad decline. Today I am inviting you to take a walk along the Riverfront Canal Walk, and I will tell you a little about Richmond’s history and what impression it produces on a visitor first coming to the city. By the way, this Canal Walk shows you the only metropolitan whitewater river in the United States in its utmost12 splendor. Richmond, located in Virginia, was chartered13 as a town only in 1742, but the heroic past of the first English settlers stretches back as far as 1607, when Jamestown was founded. In 1775, Patrick Henry threw into the world the phrase for which Richmond is notorious and which foreshadowed the Declaration of Independence: “Give me liberty, or give me death”. No doubt, this very phrase determined the city’s rebellious future. When the Civil war between South and North broke out, the orange Confederacy banner with two blue crossing diagonal stripes (now officially strictly prohibited) was raised above official and private buildings. The South did not want to yield14, and in 1861, when Jefferson Davis was inaugurated as President of the Confederate States of America, the White House and Executive Mansion of the Confederacy were located in Richmond. Built in 1818, the House is a neoclassical masterpiece which served as the social, political and military center of the Confederacy. Today it is the premier museum of the Confederate history. Four years later the House was seized by the Union Army by Ulysses S. Grant’s troops in April 1865. A week later, Robert E. Lee surrendered to Grant at Appomattox. Richmond is proud of having the first electric streetcar system started in the United States in 1888. But, unfortunately, having lost its status of a capital, it started losing its importance little by little as well. Edgar Allan Poe’s very contradictory career was started in Richmond, and today Edgar Allan Poe Museum will tell you about how the future America’s greatest Romantic poet was chased away from University thus subject to his rather questionable15 actions. In the sixties, the “downtown boom” led to the construction of more than 700 buildings. To tell the truth, I was amazed to learn that Richmond is seldom visited by tourists coming here in groups aiming16 to see, for example, the famous Jefferson Mansion. May be there are less attractions per square mile than in New York, but the city produces no provincial impression the way we Europeans usually think of it. The urban system of Richmond is clearly divided into two areas: Richmond (downtown, including the historical Carytown District), and Greater Richmond, that is, Richmond and all the neighboring17 counties. Architecturally it represents a typical example of any other big American city: the downtown area planned in squares with skyscrapers and straight streets (although somewhat diminished18 compared to New York or Chicago), the uptown filled with one- or two-storied buildings buried in verdure19, with streets laid more chaotically than in the center. Unlike Europe, there is a tendency to spread cultural layers more or less equally throughout the country’s surface. Would there be any other provincial city, however big it is, to boast20 one of the fullest and most amazing collections of Fabergй eggs and decorations, as Richmond Museum of Fine Arts can? 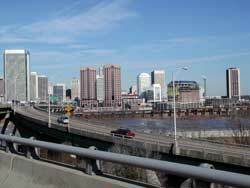 It is dubious21 you will be bored in Richmond: its cultural life is as interesting as its history. Almost every church and chapel offers organ music concerts; there are several symphonic orchestras, a dozen of cinemas, and, of course, hundreds of night pubs and clubs where you will be treated not only to various delicacies22, but to the juicy folk and jazz music performed by guest professional as well as by local amateur artists. The description of Richmond would not be entirely full if we do not mention its rich University life. Two main Universities are in constant rivalry and friendship, University of Richmond and University of Virginia, both housing hundreds of highly-skilled professionals in education. 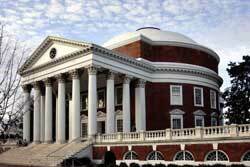 University of Richmond represents a specific interest from the architectural point of view. It has its own campus, maintained in one style, with the exclusive use of red bricks. The stylization reminds of the late 19th century Boston architecture. There is no need to leave the Campus: you live, you study and you spend your free time here. Campus system, being quite characteristic of the Anglo-Saxon academic world has not as yet found the same adoption on the Continent. Anyone who finds himself in Richmond will not fail to get seduced23 by its tranquility and beauty. This city still, as amazing as it might be, remains among the reserved areas of the modern civilization. A true explorer on the lookout24 of the authentic25 life should not neglect visiting the city one day or the other.